Mm! Let's get cozy! 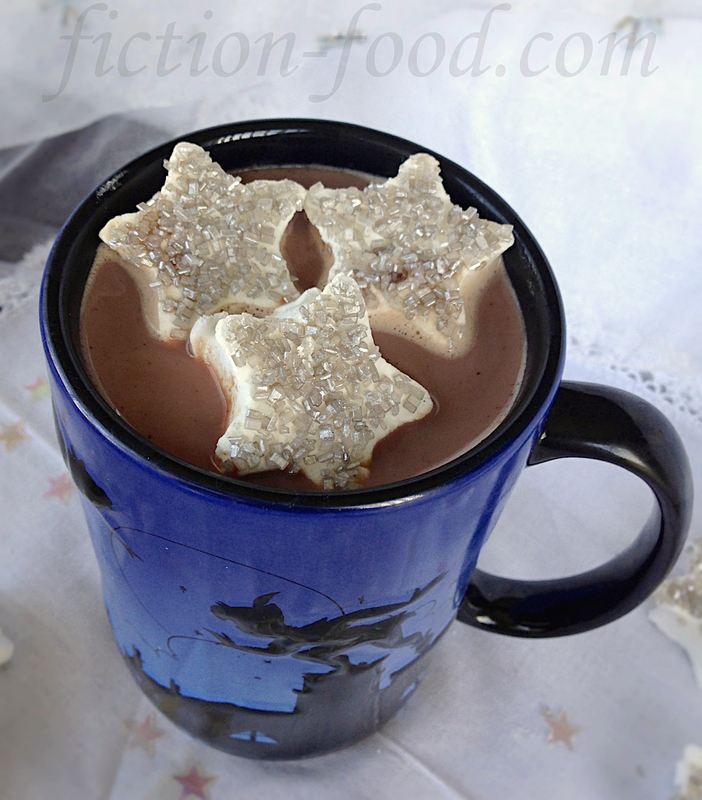 I recently posted a recipe from Disney's A Merry Christmas Cookbook for homemade marshmallows and hot cocoa inspired by the Disney film "Peter Pan" (adapted from J. M. Barrie's play), but what about hot chocolate and cocoa that is actually mentioned in fiction and not just inspired by it? Several come to mind and I've concocted what I imagine those drinks to be. A couple, like The White Witch's drink from The Chronicles of Narnia and Mrs. Cake's drink from "My Little Pony: Equestria Girls", aren't specifically said or shown to be cocoa or chocolate, but that's what I imagine them to be so... that's what you'll find below (in the case of Mrs. Cake's drink though, it's more about the decoration). 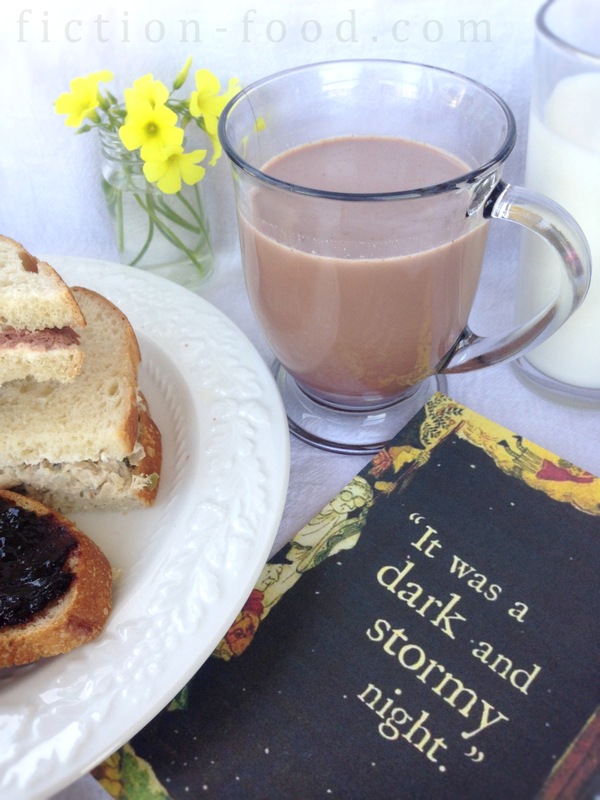 "Edmund felt much better as he began to sip the hot drink. It was something he had never tasted before, very sweet and foamy and creamy, and it warmed him right down to his toes." 1. In a small pot on medium heat, melt the chocolate with the heavy cream. Whisk it well & then add the milk, continuing to whisk & simmer (not boil!). Add the mint leaves & simmer for about a minute more while stirring. Remove the leaves (this is why it's easier if they're on a stalk) & pour the hot chocolate into a serving mug. If you'd like to make it foamy, before pouring it into a mug, blend with an immersion blender. 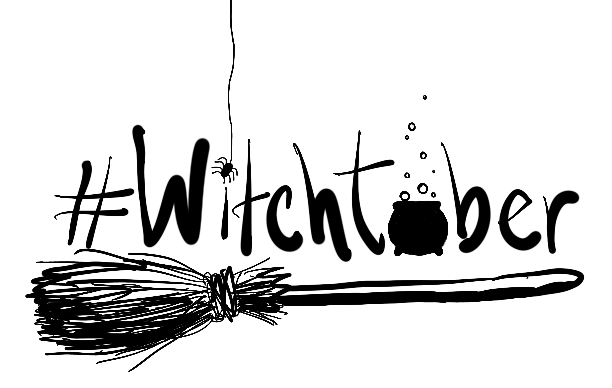 Drink alongside Turkish delight (try this recipe from a previous post) & entertain delusions of grandeur while cuddled with a witch. 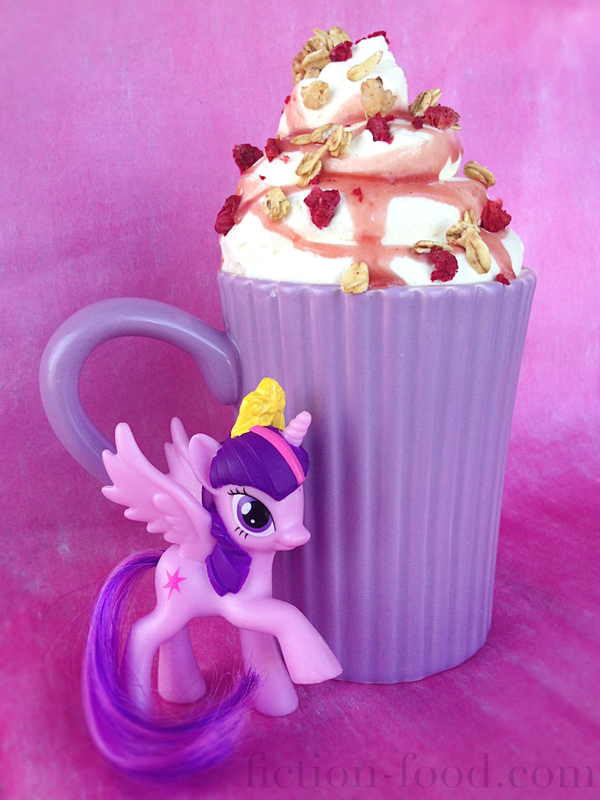 Twilight Sparkle: And can I get mine with extra oats? Twilight Sparkle: Uh, scratch that! However you normally make it is fine. 1. 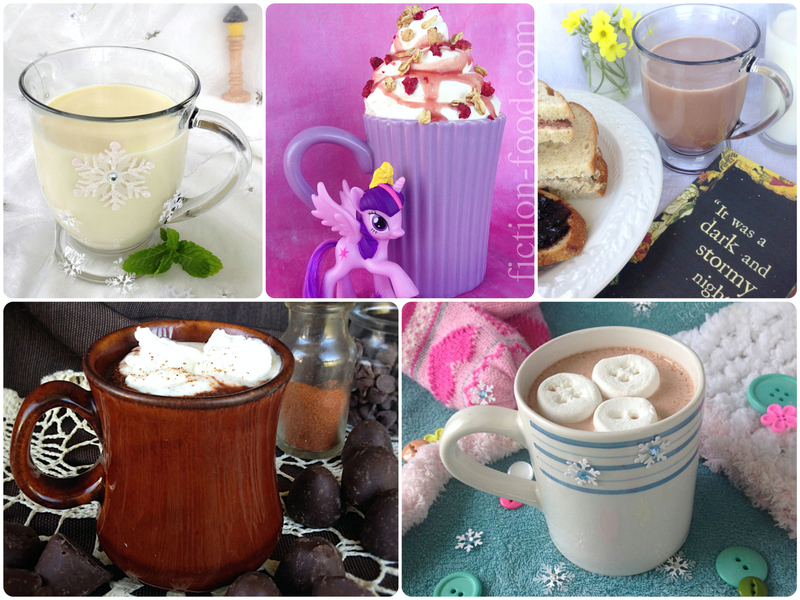 Make cocoa as you like. Pipe a large spiral of whipped cream on top (I spooned my homemade whip into a sandwich baggie & snipped off a corner to get a thick spiral). Use a spoon to swirl-drizzle strawberry or raspberry syrup on top. Sprinkle with oats (like granola) & freeze-dried strawberry or raspberry bits (I simply got a bag of granola with the fruit bits in it). Spill directly onto the guy you like because walking is hard and you need an adorkable moment to say something like "You know me! Always trying to make a big splash around here. 'Cause...my drink...just kinda' splashed...on the ground [awkward laugh]." If you choose not to spill it, how about serving it with Rainbow Dash fudge or Spike's Sapphire Cupcakes? “You put in more than twice enough milk.” Meg peered into the saucepan. “I might like what?” a voice said, and there was their mother standing in the doorway. 1. In a medium pot on medium heat, combine the 1/3 cup milk, sugar, & cocoa powder, stirring constantly (I prefer using a whisk) until the mixture comes to a boil & you've got a nice chocolate syrup. Turn the heat to low & slowly pour in the remaining 2 cups of milk while continuing to stir. Add in the optional vanilla. Stir until fully incorporated & heated through. Remove from heat & pour into 2 mugs. Sprinkle ground nutmeg on top (optional) just before serving. Drink with various sandwiches (recipes here from a previous post), preferably during a nighttime storm in a cozy kitchen musing on tesseracts. 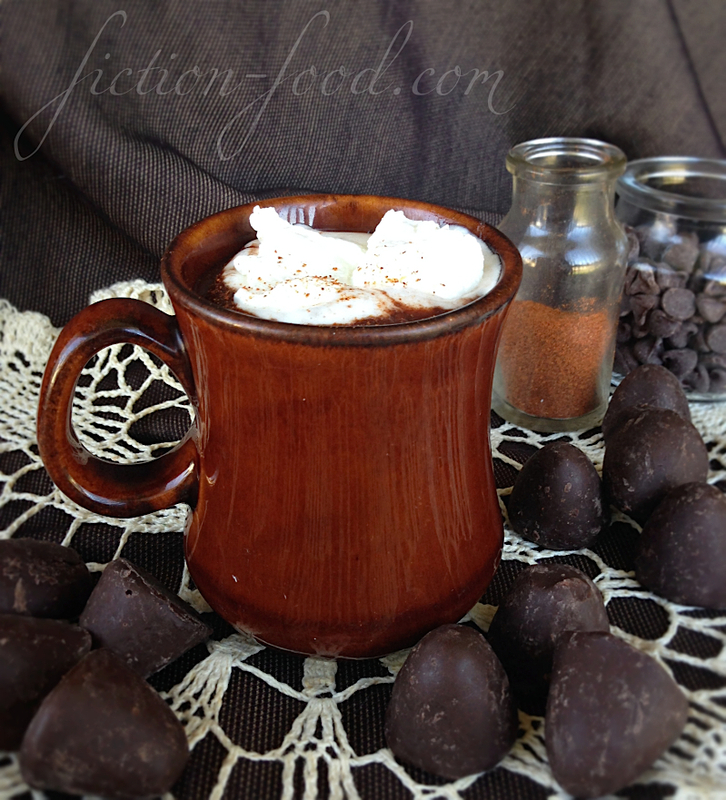 Mrs. Voizin: Chili pepper in hot chocolate? Vianne: Mm-hm. It'll give you a lift. Mrs. Voizin: [takes a sip] It tastes like...I don't know [giggles]. 1. In a small pot over medium heat, float the cinnamon sticks in the heavy cream & bring to a nice simmer for a few minutes. Remove the sticks & add in the chocolate & sugar. Stir until melted & smooth. Add in the milk & continue to simmer & stir until thoroughly combined & heated through. Pour into a serving mug & sprinkle with a pinch to a dash of ground chili pepper (depending on how adventuresome you are & how playful you'd like to be). Top off with a dollop of whipped cream. "Now, if you mix a bit of the French vanilla with a dash of raspberry, you will have the perfect cup of cocoa. This one gets rid of test-taking nerves." –Mittens Fluff n' Stuff, "Lalaloopsy Girls: Welcome to LALA Prep School"
1. 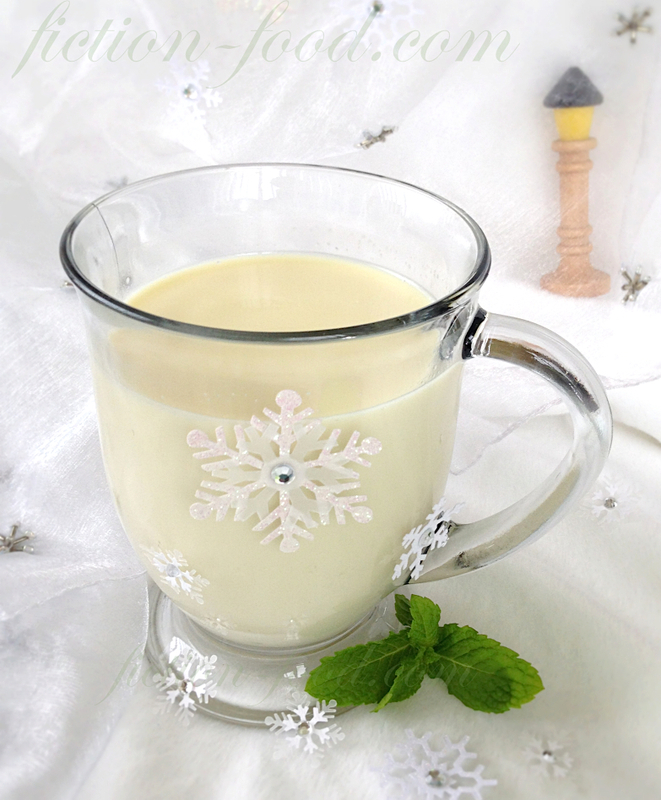 Heat the milk in a regular size mug for about 3 minutes in the microwave. Add the cocoa powders & stir until dissolved & combined. Next, pour in the cream. 2. Sprinkle a plate with powdered sugar. Cut the marshmallow into about 1/4" discs & place them on the plate. 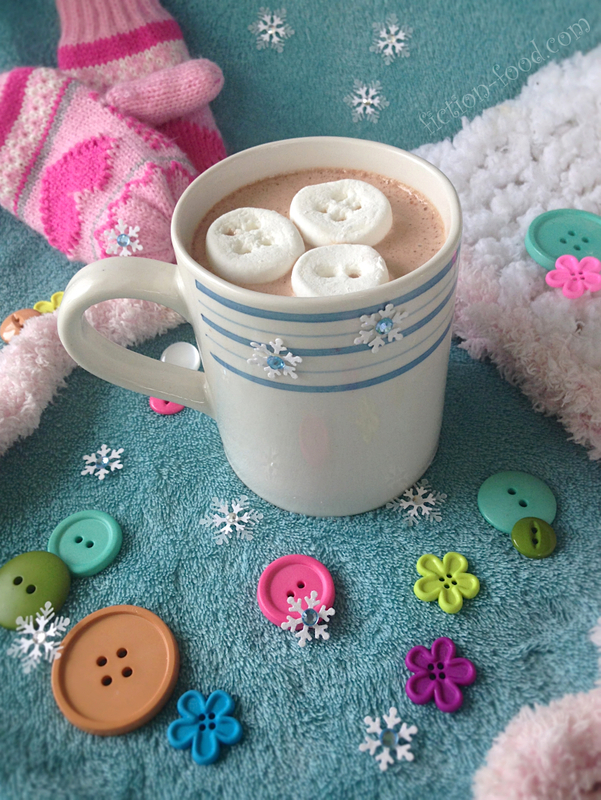 Use a straw to poke 2-4 holes in centers of the marshmallow slices to look like buttons. Toss in the powdered sugar & then float in cocoa when ready to serve. Stay frosty, peeps, and do some yoga. Also, listen to this fantastic song (smalls and I rock out to this often). Recipes from Disney's A Merry Christmas Cookbook. So excelente warm with homemade dulce de leche whipped cream on top! Known as po cha in Tibet. It's not as bad as it might sound! Great for protecting against chapped lips. Favorite of abbey animals, horse girls on windswept islands, and probably young, rich, Welsh king-seekers. 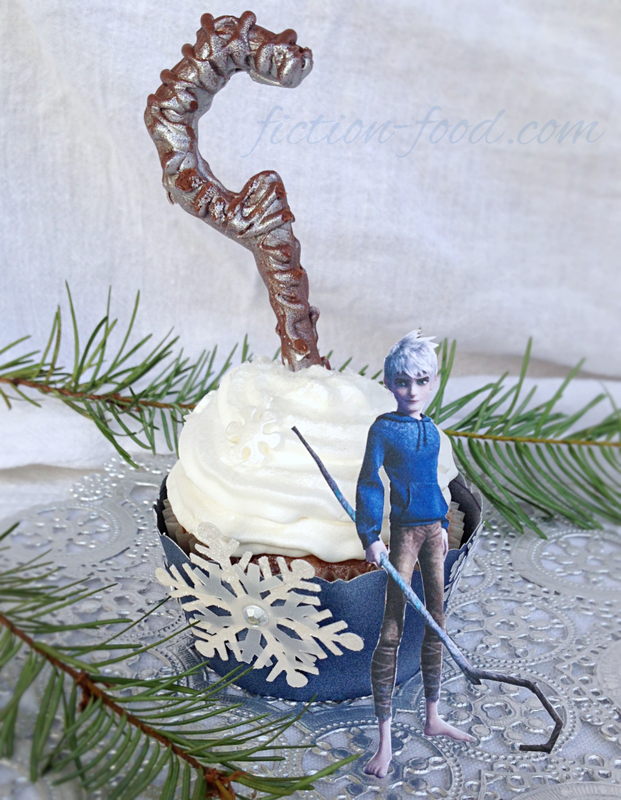 There's also a recipe on the blog for Jack Frost Cocoa & Marshmallow Cream Cupcakes inspired by "Rise of the Guardians"! 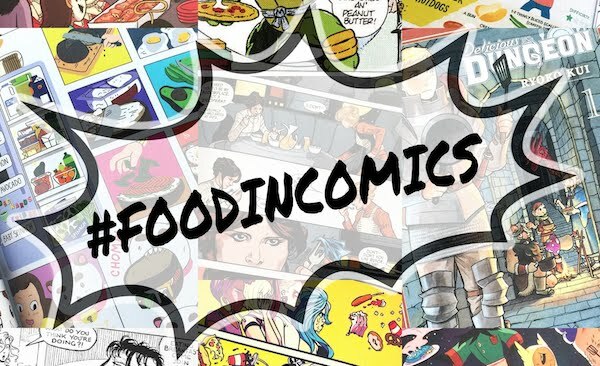 What cocoas or hot chocolates from fiction can you think of?